When most people think of veterans, they think of soldiers, sailors or pilots battling on the front lines. Very few think of the role May Segal played. 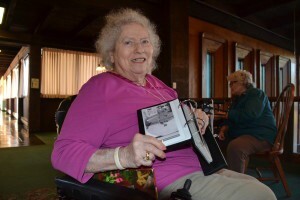 Segal, a resident at the retirement community Cadbury in Cherry Hill, served as an Army nurse cadet during the end of World War II. While she was not directly involved in the fighting, she was honored along with other veterans for her service to the United States. 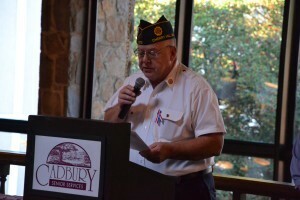 Cadbury at Cherry Hill honored all its resident veterans during a ceremony on Nov. 12. 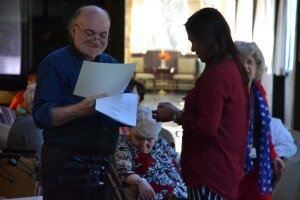 Each veteran in attendance was given a certificate and a pin in appreciation for their service. Segal’s story of her time as an Army nurse began when she signed up to try to serve on the front lines. She was eventually denied after failing a physical, something for which her parents were very grateful. “All they could see was their child was not going to the front,” Segal said. Segal instead worked as a nurse in an Army hospital, a job she describes as very challenging. She was trained to treat all sorts of injuries and maladies. Despite the challenges, the Army helped drive Segal to be the best she could at her job. When she left the Army, she continued to work as a nurse for more than 50 years. “I made it my life career,” she said. For some veterans, recognition at the Veterans Day ceremony means more than words could describe. Army veteran John Heal served for six years during the Vietnam War era. Unlike many soldiers who were drafted, Heal decided to volunteer. Heal was never thrust into battle during Vietnam, but he was honored for service just like every other veteran. A large smile broke across Heal’s face as he received his pin during the ceremony. The ceremony wasn’t just emotional for those who were honored. Representatives from Cherry Hill American Legion Post 372 shook hands with every veteran in attendance. Commander Bill Quinn was extremely emotional during the ceremony. He talked of how they were not only honoring the veterans in attendance, but all those who served in the United States military over the years. “You all gave some and some others gave all,” he said. Everyone understood the meaning behind what Quinn said, including Segal. She was nearly a part of a group of nurses who were sent to serve in Japan. She said Japanese forces captured the entire group, and none of the nurses ever made it home. Segal added she was fortunate to be in the position she was. However, she will never forget the ultimate sacrifice some of her comrades made, even those who served without being in combat.